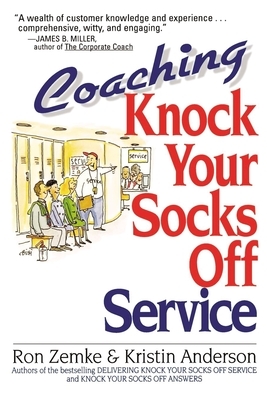 "Knock your socks off service doesn't just happen. It requires coaching on an ongoing basis. Now, thanks to authors Kristin Anderson and Ron Zemke, supervisors have a practical guide to the day-to-day challenges that arise in training superior customer service people. This newest Knock Your Socks Off book explains how to help frontline employees hone their skills, maintain the motivation to perform, and meet new situations head-on. The authors present a model for successfully coaching anyone, anywhere, and they show readers how to apply it in familiar coaching situations. Everyone can appreciate Zemke and Anderson's strategies for handling the toughest coaching problems. And they will learn a most important new skill-- teaching employees to be peer coaches, a growing need in the current era of teams and of doing more with less. KRISTIN ANDERSON is a principal of Performance Research Associates, co-author of two previous Knock Your Socks Off books, and author of Great Customer Service on the Telephone (AMACOM). RON ZEMKE is founder of Performance Research Associates and has authored or co-authored twelve books, including the Knock Your Socks Off series and Service America! This is the fifth book in the Knock Your Socks Off series, which has also engendered three major training programs, eleven films, and even a board game!